Kyle Whyte is the Timnick Chair in the Humanities and a professor in the departments of Philosophy and Community Sustainability at Michigan State University. 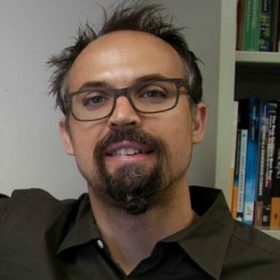 His research addresses moral and political issues concerning climate policy and Indigenous peoples, the ethics of cooperative relationships between Indigenous peoples and science organizations, and problems of Indigenous justice in public and academic discussions of food sovereignty, environmental justice, and the anthropocene. He is an enrolled member of the Citizen Potawatomi Nation. Kyle is involved in a number of projects and organizations that advance Indigenous research methodologies, including the Climate and Traditional Knowledges Workgroup, Sustainable Development Institute of the College of Menominee Nation, Tribal Climate Camp, and Ngā Pae o te Māramatanga New Zealand’s Māori Centre of Research Excellence. He has served as an author on the U.S. National Climate Assessment and is a former member of the U.S. Federal Advisory Committee on Climate Change and Natural Resource Science and the Michigan Environmental Justice Work Group. He is a recipient of the Bunyan Bryant Award for Academic Excellence from Detroiters Working for Environmental Justice.